Frost-tender rhizomatous perennial with a basal fan of sword-shaped leaves and, in summer, a succession of flat, scented, mid-blue flowers with white, yellow and brown stripes. To 60cm. [RHSE, Hortus]. ‘This most elegant plant is a native of Brazil, and of very recent introduction. It flowered with us in March. 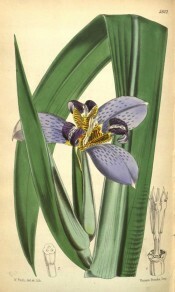 The leaves are three feet in length, and the flower stem, which appears at first exactly like a leaf, except having a stronger midrib, is of the same length: at about a foot from its extremity it opens on one side, and produces the spathes, which are several, and each produces many flowers, coming out one at a time in long succession.’ [LBC no.407/1820]. ‘A newly observed species from the Brazils; very near to the beautiful and well known M. northiana.’ [BR f.713/1823]. ‘A magnificent plant, native of the Brazils, long known in our gardens, though displaced of late by newer but far less attractive favourites. Whether for the boldness of its distichous sword-like foliage or the magnificence of its fine Iris-like flower, it is well worthy of a permanent place in our stoves.’ [BM t.5612/1866]. Fl.Ca. p.83/1838. Listed in all published catalogues [B.321/1843]. Source unknown. This plant was imported by John Bidwill from Kew in November 1843 [AJCP] but seems to have already been growing at Camden. Cypella caerulea Seub. ex Hook.f.